Monarch Air Group provides private air charter in Mobile, AL. Our clients benefit from top-notch service, unrelenting dedication to safety, wide selection of aircraft, and years of experience in chartering private jets. To obtain a free quote, please use our online quoting tool provided below, or call toll free 1-877-281-3051. Monarch Air Group provides private jet charter flights in and out of Mobile, Alabama, USA. Mobile is an industrial city and port on the coast of southern Alabama. It is the county seat of Mobile County. 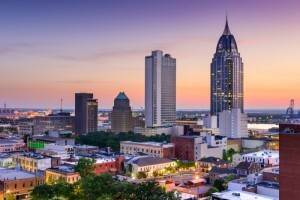 With the population of about 195,111 people, Mobile is the 3rd most populous city of Alabama. Situated at the junction of the Mobile Bay and Mobile River on the northern Gulf of Mexico, it is the only seaport in its state. There are a symphony orchestra, plenty of art museums, a professional opera, a large concentration of historic architecture, and a professional ballet company. The most popular tourist attractions include Crescent Theater, Fort Conde Museum and Welcome Center, Cathedral of the Immaculate Conception, Mobile Carnival Museum, Richards-DAR House Museum, Magnolia Grove Golf Course, Museum of Mobile, Mobile Museum of Art, Gulf Coast Exploreum Science Center, and much more. The city is served by Mobile Regional Airport (MOB / KMOB), which is located 19 miles from the center of Mobile. 1. BFM, Mob Aerospace, Mobile, United States. 2. BIX, Keesler AFB, Biloxi, United States. 3. GPT, Gulfport-Biloxi International, Gulfport, United States. 4. GUF, Edwards, Gulf Shores, United States. 5. MOB, Mobile Regional Airport, Alabama, AL, United States. 6. MVC, Monroe – Walton County, Monroeville, United States. 7. NDP, Ellyson NAS, Pensacola, FL, United States. 8. NHX, Barin Olf Osn, Foley, United States. 9. NPA, Pensacola NAS, Pensacola, United States. 10. NSE, Whiting Field NAS, Milton, United States. 11. NUN, Saufley NAS, Pensacola, United States. 12. PGL, Jackson County, Pascagoula, United States. 13. PNS, Regional, Pensacola, United States. 1. Hampton Inn & Suites Mobile Downtown Historic District, 62 South Royal Street, Mobile. 2. Reissance Riverview Plaza Hotel, 64 South Water Street, Mobile. 3. Hampton Inn & Suites Mobile Downtown Historic District, 62 South Royal Street, Mobile. 4. Reissance Riverview Plaza Hotel, 64 South Water Street, Mobile. 5. Holiday Inn, 301 Government Street, Mobile. 6. Hampton Inn & Suites Mobile Downtown Historic District, 62 South Royal Street, Mobile. 7. Reissance Riverview Plaza Hotel, 64 South Water Street, Mobile. 8. The Battle House Renaissance Mobile Hotel & Spa, 26 North Royal Street, Mobile. 9. Radisson Admiral Semmes Hotel, 251 Government Street, Mobile. 10. Hampton Inn & Suites Mobile Downtown Historic District, 62 South Royal Street, Mobile.